When the customer transports sticky materials such as clay, nickel ores, moulding sand, coal etc. 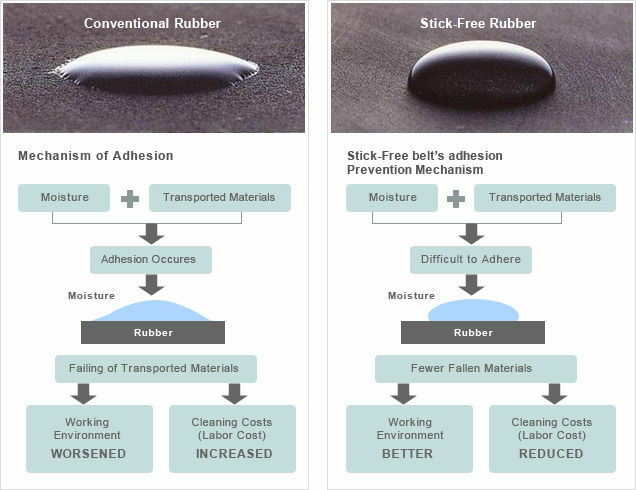 and has trouble with adhesion of ore to the return side of the belt, we recommend using our conveyor belt with “Stick-Free Rubber”. Bridgestone's stickfree belt is best used in combination with belt cleaners. A conveyor belt with "stickfree rubber" releases materials at the cleaner almost perfectly.